Readers of this blog have known for years that Sunborn, the new Chaos book, was coming—or at least it’s been my word against the doubters. (Sometimes, I’ve been among the doubters.) Well, you no longer have to take my word for it! It’s up on Amazon. And you can even preorder it. Now. Today. Go ahead, click the link! It won’t hurt. That’s the news from here. I might not get this written up before I go, so I’ll just mention that next week I’ll be heading up again to the Bread Loaf writing center near Middlebury, Vermont, to teach at the annual New England Young Writers Conference. If you are, or are the parent or teacher of, a young writer of high school age, you really should look into this for next year. It’s a terrific program. I’ll tell all about it, after I get back. And did I mention? 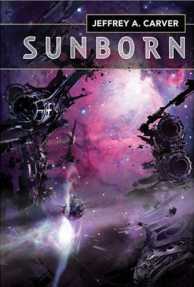 You can preorder Sunborn from Amazon. I really like that cover! And I’ve got it pre-ordered. You guys are making my day! Congrats on getting it out! I never lost faith and just happened to check your page and blog today. Though note that it is listed as “Sunborn by Jeffrey Carver and Jeffrey A Carver” so it seems the cloning experiment was successful 😉 as I recall you have daughters but not a son with the same name. Hopefully this means you can write twice as many books now! neither of which I knew before. Huh. I wonder if that’s a real date for the paperback, or a placeholder. And how did you find it? I only got to it by using your link. I found the softcover simply by searching for “Sunborn” on amazon.ca — this also yielded the 2003 album “Sunborn” by Deadly Sin and “The Sunborn” by Gregory Benford released in 2006 (I think you mentioned the possible conflict with your title at one point). I don’t see the paperback on amazon.com but it also has MP3 downloads of Deadly Sin’s album (never heard of that band). I have no way to judge the validity of either the October 2008 date for the hardcover or the January 2010 date for the paperback but I assume Amazon got them from Tor. Tor’s web page doesn’t list Sunborn at all in the upcoming books section. 12-18 months isn’t that unusual a lag time for the paperback to come out, is it? I’m not in the publishing biz but that’s what I’ve observed when buying books. For anything I’m waiting for I’ll of course buy the hardcover instead of waiting. I only buy softcover when I’m looking for something to read while on vacation. Sadly, there are few English language books on my reading list these days.